We stayed on an overflow site, just water and electric. Many long term. Most sites would be very difficult or impossible for large rigs. It was OK for an overnight. 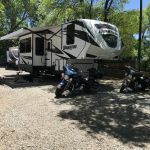 We camped at Silver City RV Park in a Motorhome. The $30 was for cash; credit card is $33. Very nice and friendly staff. The park is very small and located in a rough area of town, as others have noted. But the park seems secure and is clean. The layout is odd but not in a bad way, as sites are plenty large. The cable TV was sparse. Stayed only one night but would stay here again. We camped at Silver City RV Park in a Motorhome. We stayed here for a week and enjoyed a weekly rate. This is a great park located close to the historic downtown. The sites were close on one side and spacious on the other. It was clean with a new table, a cute picket fence and friendly neighbors. There are some long term residents who are also friendly. The restrooms and showers were IMMACULATE and nicely decorated. The office staff helped to direct us to the many restaurants and places to see in the area. The store/cafe in the office has fresh brewed coffee, some pastries, newspapers and change for the laundry. We camped at Silver City RV Park in a Motorhome. Thank you so much for your kind words about our park. We're glad you had a nice stay and look forward to your return sometime. This is a decent, reasonably priced place to use as a base to explore the area as long as you don't mind being in an urban setting. I chose this place to stay because $175 for FHU for a week is a great value and because it was "walking distance" to the historic downtown area. Well, it probably is if you are younger than I and in better shape! For me, it was not a comfortable distance. That was ok though because I found the town disappointing. Not nearly as charming as I expected and very few restaurants. The RV park was very clean, owners very friendly, and all the hookups worked fine. Most sites are used by long term residents, though, and there aren't a lot of spaces available for short term stays. Some of the sites are also quite small and some seem like they would be very difficult for a big rig to access so I suggest calling ahead. The laundry room is small with four washers and dryers but the prices are good and everything was in working order. No coin changer, though. The restroom/showers were also clean, bright, and modern. Especially appreciated the holders in the shower stalls for your bath products and a hair dryer, at least in the ladies' shower. Good pressure and lots of hot water too. Also, a nice size dog-run that the pup enjoyed using. Wi-fi even worked some of the time. Verizon signal was strong. My only complaint was that although the park itself was very quiet there were emergency vehicles racing by a block away with sirens blaring at least a half dozen times a day. In 19 months on the road, I've never experienced anything like it. Guess all the emergency services must be located nearby. Probably would not stay again simply because we prefer to be further away from town, but that's the only reason. We camped at Silver City RV Park in a Truck Camper.